Julie: As soon as I saw this question my mind went to NCIS, because my husband and I always joke that NCIS is the kind of show “real Americans” watch, “real Americans” being the kinds of people who leave their cable boxes on CBS and never change it until Leno comes on. But, as much as I like NCIS (and I do! ), I’m not sure that show paints any kind of accurate picture of what living in America is like. Except that we all build boats in our basements, Emma Fraser, we do. Living in Chicago, my America looks (unfortunately) a lot more like The Wire right now than anything else. We have the gangs, the murders, the police and neighborhood folks trying to make a difference, the politicians stymying any progress, and the people living outside all that messiness who have no idea how any of these problems can ever be solved. It’s not Mayberry. It’s not the DC (or the LA) office of the Naval Criminal Investigative Unit, where every crime is wrapped up in 45 minutes. But it’s no less American than either of those places. Andrew: Ignoring the obvious, eponymous American-ness of Idol, Dad, Horror Story, Dreams, and Gladiators, the show that most speaks to me as being “American” is The Brady Bunch. I do not have a really good reason; The Brady Bunch is not a patriotic show in any way, nor does it reflect any realistic form of the American experience or typify American life. But there is something about that 3×3 grid, that theme song, those nine people, that make it seem to me like the quintessential (though certainly not a qualitatively great) American sitcom. Perhaps it is the show’s ubiquitous nature. Does any American not know “Marcia, Marcia, Marcia” or Johnny Bravo or (unfortunately Cousin Oliver)? When Davy Jones passed away last year, every story included The Monkees, but also his one Brady episode. Perhaps it is the all-American nature of the family (all the girls DID have hair of gold, like their mother), or the constant, almost unnerving cheeriness (despite the show being about at least one, and perhaps a second, young widower- the end of Carol’s marriage is never discussed), that makes The Brady Bunch strike me as the American ideal. Cameron: This is kind of a difficult question for me because, on the one hand, all pop culture made in America is inherently American, particularly with regards to its value as a cultural export and on the other hand shows that attempt to portray a broad scope of what it’s like to live in America are virtually non-existent, with most shows focusing on smaller aspects that contribute to the whole. (Such is the strength of television.) A commonality I’ve noticed among my generation is a fondness for The West Wing in part because it somehow managed to teach more about civics than actual civics classes. That’s simultaneously a commentary on the failures of our education systems for not providing adequate resources for teaching the really important stuff (like, I don’t know, how our systems of government actually are supposed to function) and a nod of positivity to Aaron Sorkin, who whatever his flaws regarding the writing of his characters at least had the good sense to write a civic-minded show for network television. The West Wing is still a hell of a relevant show to this day. Emma: This is a tough question as the only (?) non-American in the group so I’m going to have to go with the show that had a huge impact when it aired in the UK and that’s Friends. Friends started my first year of high school and it’s been airing in one way or another since. It might not be the best representation of what America is really like – 6 white, relatively well off characters living in amazing apartments in New York (or really an L.A. sound stage) and while it wasn’t the first US import it was the biggest US import as I was growing up. When Friends came over to London to shoot Ross’ wedding it was a big deal and I’m glad we’ve come along way since the holiday that you are celebrating (yes I’m somehow comparing US/UK relations with Friends shooting in London). Julie, I’m glad to hear that there is boat building going on. Sabienna: Deadwood may seem like too obvious of an answer, but in that grimy tale of people building a community on the last western frontier, David Milch painted the quintessential American story. The one where a bunch of people came together because they wanted to be beholden to no one other than themselves, but in the process ended up realizing they were stronger together than they ever could be alone. Over the course of three seasons, we watched Deadwood emerge from anarchy to become a real town only to then have the very thing they built threatened by a man with more money and more power than they could imagine. In between, Milch introduced a host of characters from a dozen different places and then showed us in beautiful, heartbreaking, exquisitely written strokes how they came together: the perpetually angry Sheriff Bullock who pulled the town back from the brink of lawlessness, the prostitute Trixie who never dared to dream of a better life until she did, the belligerent and bighearted Calamity Jane, the unlikely chums A. W. Merrick, editor of the town paper, and Blazanov, the telegraph operator, and, of course, Al Swearengen, the man who presided over this microcosm of Americana that may have been set in the past, but which reflects where we’ve been and where we are today and probably where we’re going better than any other series I’ve ever seen. Whitney: My first instinct was M*A*S*H, but I’ve used that before as an answer and it also seems too easy for some reason. The second thing that popped into my head was Dukes of Hazzard and I think as far as all American you can’t boil it down more than Bo, Luke, Daisy and the gang. The boys had All-American looks, and there was Daisy Duke with her quintessential good looks and the shorts she would give a name to for the next two decades. But looking past appearances, between the General Lee and the sheriff and the boys constantly getting in trouble and then having to extricate themselves in a muddy chase through the South, everything involved is a cliche of America in the 80’s. The entire show is basically the “boys-will-be-boys” mantra boiled down to its roots. Not in any political way either! The way that in any other town in the USA, it probably wouldn’t be that out of the ordinary to have two pretty good looking boys getting in scrapes and causing trouble for everyone, but still be part of the community at the end of the day. 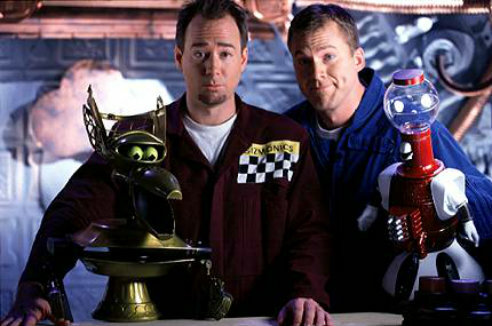 Jessica: Oddly enough the first title that popped in my head is Mystery Science Theater 3000. Doubly so for wearing its Midwestern roots with pride. The whole concept speaks to the irreverent tone of American pop culture, mocking movies out loud while revealing a deep affection for these turkeys and misfires. In turn showcasing some of the oddest home grown films. There’s a mishmash of influences in the show’s conception from Firesign Theater to Sun Ra albums. All of it comfortably coexisting in an inadvertent collage of 20th century American art, history, and media. And poopie jokes. It’s a fascinating 90s time capsule and strangely timeless, watch out for snakes. Anyway, TV is as American as it gets. But what is the most American TV show? That’s a tough question, but I’m going to have to go with the show that I feel started the ascendance of American TV to a true modern art form. I’m speaking of course of The Sopranos, which launched the trend of the gritty serialized cable drama: something that has defined the country’s television landscape in the 21st century. It’s not the greatest American television drama, and maybe not even the one that best captures the essence of the United States. (I’d say both of the other HBO classics, which others have already mentioned, define us even better.) But as far as I’m concerned, it is the quintessential one. Andy: I’m tempted to go with The West Wing, which relished acting as a weekly history or civics lesson as much as a piece of TV dramedy. Or something like Taxi, whose characters—never losing faith in the pursuit of goals they’ll never been good/lucky enough to achieve—pretty tidily sum up most people’s experience of the “American dream.” But America is a sprawling, messy country with towering virtues and pervasive flaws, with hundreds of lifestyles and environments, cultures and subcultures, roiling alongside one another. The show that’s best captured the full scope of that identity has been The Simpsons. Savagely cynical yet at times surprisingly sweet, the show has posited Springfield as a microcosm of this nation from its earliest seasons. It’s an exemplar and a parody and a deconstruction of the sitcom, one of the few art forms truly invented and cultivated in America. It has satirized virtually every skirmish in the culture wars with icy precision. It has celebrated and pilloried every corner of late 20th/early 21st century American life, from Hollywood to Washington, from small towns to big cities, art, entertainment, sports, politics, religion, race, gender, sexuality, capitalism, crime, media, intellectuals, anti-intellectuals, and monorails. It has been a cultural pariah and a cultural icon. If Ben Franklin were alive today, he would’ve guest-voiced on The Simpsons in a heartbeat. No question. Nothing wrong with any of those answers. It’s a tough question and one that can easily be interpreted differently by everyone. I guess if I had to answer in a hurry, I’d say GUNSMOKE. The western is the only film genre that is uniquely American, and GUNSMOKE is the most successful western series of all time. Not only was it enormously popular on CBS, it is one of the few shows that debuted in the 1950s that is still running today, somewhere, on some cable network or independent station.